I’d like to thank The Courtney Diaries for nominating me for the Liebster Award! I’m so happy that people are enjoying my blog because I working really hard on it. Thank the blogger who presented this award and link back to their blog’s homepage. I have been fascinated with other countries ever since I can remember. When I was in preschool one of my favorite things to do was to look at the globe with my father. He would tell me the names of the countries, and because I was so fascinated, I remembered so many that my mother began to wonder if I had a photographic memory (I don’t, but I can imagine how handy that could have been). I speak English, Spanish, and some French. I also went to Hebrew school as a child but I can’t say much. I’d love to learn Portuguese (I’ve heard it’s easy if you already know Spanish) and one day take on the daunting task of learning Arabic or Mandarin. I’m currently studying abroad in Spain. I’m living with a very warm Spanish family and I’m taking a full course load in Spanish alongside local students. When I’m in the USA, I get a bit too excited whenever I meet someone from another country (which happens a lot) and I feel the compulsion to ask them a million questions about their homeland. In addition to the USA, I’ve been to Bermuda, Mexico, Canada (Quebec), Spain, Italy, Vatican City (hey, it’s technically a country), Gibraltar, the Netherlands, and Belgium. I realize what tremendous luck I have and I am deeply grateful. I’ve been to the following states (and my family may have driven through a few more): Maine, New Hampshire, Vermont, Massachusetts, Connecticut, New York, New Jersey, Pennsylvania, Virginia, Georgia, Florida, Minnesota, California, and Hawaii. One of my biggest hobbies is photography, which goes very well with traveling and blogging. Lately I’ve been asking people who ask where I’m from if they want to take a guess (usually these conversations occur in Spanish or French). The answers are always interesting – more people guess the UK than the US. I used to live the exact opposite of a minimalist lifestyle and hold onto any and all junk I didn’t need, thinking I was being economical or something. Studying abroad has forced me to pack light and realize that I don’t need to bring a ton of random stuff with me wherever I go. 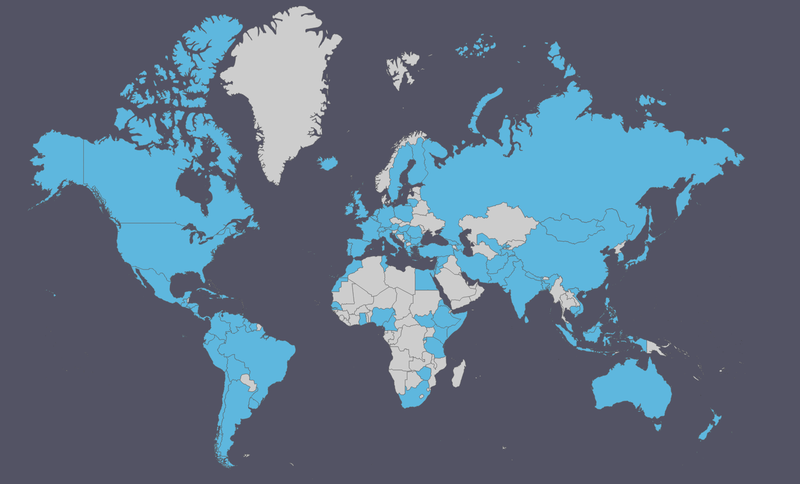 I have met people from the countries on this map. I was looking for resources about studying abroad, and I found a lot dealing with the daily life in study abroad programs but not much info for the side trips I know a lot of students like to take on weekends and breaks. While there are travel resources out there, it’s harder to find things for the student budget. Although I really want people of all genders to enjoy my blog, I’m hoping that other young women who might have reservations about traveling might feel encouraged after reading my posts. 2. What’s your happiest memory from the past year? That’s SO hard. The past year was one of the best years of my life. Obviously all my travels have been amazing, and also my birthday was great but that’s not particularly surprising. I can think of countless meaningful conversations I’ve had with so many different people over the past year, and for that reason I could never pick just one memory. 3. If you could travel anywhere in the world, where would it be? I love this question. It’s not an easy one, so I’m going to pick completely random and hope that my gut instinct means something – Istanbul, Turkey. 4. If you could only eat one meal for the rest of your life, what would it be? 5. What is the one thing you cannot leave the house without? 6. Have you ever been told you look like a celebrity? If so, which one? Not that I can think of. Although someone once said I look like Freddy Krueger ­– really sweet. Hosting a travel tv show (hey, it says dream job). 8. If you could be any fictional character, who would it be and why? Hermione Granger. I know that’s not the most unique answer, but who wouldn’t want to go to Hogwarts? 9. What would your superpower be? Teleportation! I’d get free travel and I could get myself out of some icky situations fast. Those awesome indoor playgrounds where people sometimes had birthday parties. 11. What would the title of your autobiography be? I would like to nominate the blogs listed below. They’re all very high quality and I would definitely recommend them to anyone looking for new travel blogs to follow. Why did you decide to go abroad? What are you studying/What did you study back home (ie college major, concentration, degree)? If you could wake up tomorrow magically fluent in another language, which language would you pick and why? If you could travel anywhere in the world for free, where would you go? What do you miss the most about your home country? What’s the biggest difference you’ve noticed between your home country and your host country? What’s one piece of your host culture that you would like to bring home with you (a recipe, schedule, mannerism, outlook ect)? What have you found to be the hardest part of living abroad? What is your favorite memory so far of your time abroad? What advise would you give to other young people considering living abroad?